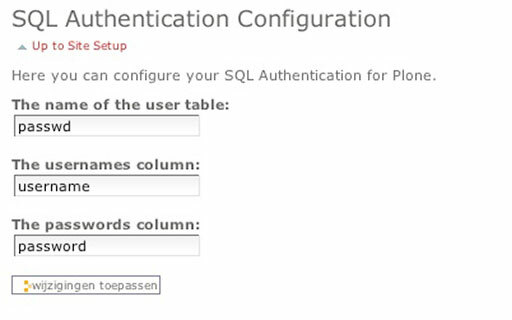 Using a existing mysql db including over 3000 usernames and passwords to login into Plone and using a table view for there properties. I was randomly searching the Internet for some nice new articles about Plone when I stumbled into SQLPASPlugin. After some reading I start to give it a try on a project that we where working on. The project had a database including over 3000 users who could login at a administration tool built with Zope 2. The current Mysql database was connected to Zope using ExUserFolder. This worked fine for Zope, however, we are porting the application to Plone now so we needed another solution. After installation it’s time to run buildout (./bin/builout) again and start Plone (./bin/instance fg). I created a Plone site and went to the portal_quickinstaller. Here I found SQLPASPlugin, and installed it. In the root of my Plone site I created a Z MySQL Database connection, which connected to the Mysql server on my local machine witch includes the database with the user tables. Time to take a look at the SQLPASPlugin configuration screen (SQL Authentication), found in the control panel of Plone. I configured the table, username, and password column. For me this worked perfectly because all my users where in the table passwd ( created for exuserfolder a long time ago ) having a username and password column. If you don’t have a database yet follow the link at the bottom for an SQL script. That was easy, mapping the roles table to my passwd table, the rols_col_username column to my username column and the roles_col_rolename column to my roles column. Here I discovered that it was possible to map property fields to columns in my database. However, after configuring this all, my properties didn’t show up, so it was time to take a look at the plugin registry of acl_users. There was a link named ‘Properties Plugins’, I clicked it and found out it was looking for properties using the mutable_properties plugin fist, so i moved my source_properties plugin to the top. Now it was time to try it all and perform a login. To bad, it failed because ExUserFolder crypted all my passwords in a different way as the standard options available in SQLPasPlugin. So for now we made a little change to the PlainEncrypter in encrypt.py (line 79) of SQLPASPlugin. Now my plain password posted in the login_form are crypted the way ExUserFolder did it, so the comparison will succeed now. By default, SQLPASPlugin currently stored passwords as plain text. You may configure it to use MD5 or SHA encryption algorithms. In the root of your Plone site in the ZMI, go to the acl_users folder (note: the acl_users folder at the root of your plone site, NOT your Zope root). Go to the source_users folder. In default_encryption enter sha or md5 or crypt! IMPORTANT: A VERY STUPID THING TO KNOW! In my case I lost over 2k users in the user overview and it took me (not for the fist time) over an hour to figure out why! Here is all the code from my presentation "How to build a Plone site in 1 hour!" It was great to attend to the conference this year!